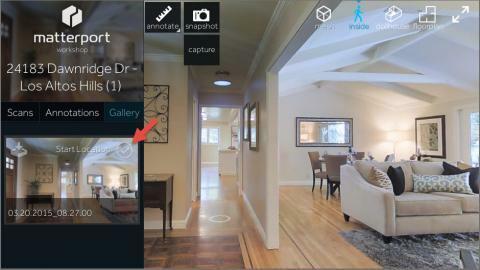 I'm super new to the Matterport, have shot 2 listings and had a question about the actual walk through tour. I begin shooting at the front door, but the tour seems to begin in the bedroom. Is there anything I am doing wrong? Or a way to keystone a space as the beginning of the tour? Is there any way to have it start in dollhouse view or only in walk through? Also, I don't seem to be able to take a snapshot in dollhouse view. Is there something I'm missing or are people just doing a screen grab to get this shot? You can take a snapshot in doll house view that will then be the start point via Workshop. @BrettMtn not sure why you cannot. Unless they changed something recently. Def still works...we use doll house view for the start of all tours. @Marcel @Tim thanks, I'll give it another try. I think my browser was having some issues when running Workshop. If you start out with the doll house view is there a way to select the starting point the walk thru begins at when it zooms inside the house? Make sure you're inside when you make the snapshot. Then, when you view the walkthrough, it will reproduce the exact composition and angle of this snapshot as your starting point. Thanks Julian but I'm not sure I worded my question correctly. I know how to capture the starting point but I want it to open up on the doll house floor plan view first. Then when you click on the walk thru icon, how do I choose where it starts or zooms to? You'd almost have to have two capture settings.